FORGET THE TOP TEN; here we had a podium. The view from our bath and shower was extraordinary as it directly faced the Grade 1 neo-classical portico of the entrance to the world's oldest public museum  the Ashmolean. Fortunately only the statues and the figures on the relief of the portico's frieze overlooked the bathroom window  so no need to close the blinds. Our views from the bedroom were the same, but lying back in the bath with a glass in hand enjoying the view must be one of the most privileged. The Randolph Hotel is something of a city landmark; quite a statement when you consider that the colleges are masterpieces of style and architecture. It is partly because it is plumb in the centre of the city close to the main shopping area and theatres. 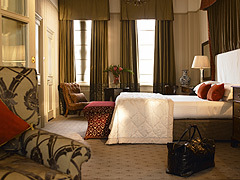 In 1864 it was unusual for a hotel to be purpose-built, and it has been improved and extended many times over the decades since it first opened its doors. Despite ongoing improvements, the Randolph has retained its period gothic revival character throughout, with the exception of the new Worcester wing and terrific basement mini-gym and spa, although these have been blended in extremely well. The hotel is surrounded by colleges and throughout its life has been the natural meeting place for the great and the good. That would naturally include some of the best intellectuals and creative minds in history. Naturally our royals have been there over the generations, together with Bill and Hilary Clinton when their daughter Chelsea was at the University. 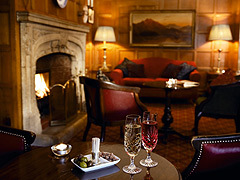 The Morse Bar, with its baronial fireplace and old-world charm, is not only a popular place to meet up but has featured many times on the large (and small) screen. Anthony Hopkins was filmed there in Shadowlands together with, of course, many of the Inspector Morse and Lewis episodes. Many of the hotel's staff have been used as extras in these films, which I am sure is a duty they perform with their characteristic impeccable style. Amusingly, the photographs around the bar of the numerous series are, of course, removed each time filming takes place. Regardless of one's fame  or in our case, the lack of it  there is a warm welcome overseen by head concierge, Neil Cowen, who is also Deputy Chairman of the exclusive 'Society of Golden Keys'  a prestigious worldwide concierge network. All is on a lavish and dramatic scale with crystal hanging chandeliers and sumptuous furnishings, high ceilings and heavy curtains. 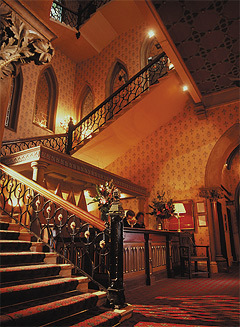 The spectacular 'Scottish Early English' staircase rising from the reception is unapologetically dramatic. We could easily imagine Morticia (Angelica Huston) descending the stairs with Gomez on her arm� You can take your pick in bedrooms from the unashamedly traditional style of brass and mahogany  which we chose  to the more contemporary feel present in the new wing. Both offer all the up-to-date features you would expect in an hotel of this grade. An essential ingredient of any cosmopolitan hotel is a well equipped gym and spa, and the new basement spa at the Randolph is beautiful. With its lantern-lit walkways and relaxing ambiance it is the perfect place to unwind. All the latest beauty treatments are available in luxurious surroundings; it is also very popular and a great place for hen parties or even stag parties for those with pure indulgence in mind. If only we had had time to take advantage of what the therapists had on offer. 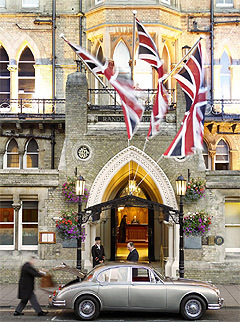 Everything is traditionally British in the hotel, including the food served at dinner. Due to the crests displayed high up on the surrounding walls of the dining room, overseas visitors would be excused for being under the misapprehension that they were dining in one of the many illustrious Oxford Colleges. Our dinner was served with a good level of service and much attention to detail under the watchful eye of the Maitre D', Giuseppe Vurchio. Giuseppe has a classic provenance beginning from his time at Chewton Glen and his display cupboard of personal awards are many  including two AA rosettes for the Randolph's cuisine. At the time of our visit he was extremely proud that one of his chefs had just won an award with a prize of a week sampling the best of food and wine in California. It was an evening to remember, starting with delicious champagne and canap�s taken in the Morse Bar  where the clientele could best be described as international, with as many foreigners as there were British guests. Presumably hungry Texans are a fixture as the following portions at dinner would have satisfied their legendary appetites! Our large plates of Scottish smoked salmon were carved at the table and then beautifully presented on dappled glass plates, the slices curled and placed to create a sea image. A glass of excellent Sancerre was a good complement to the fish. This was followed by succulent and tender thick slices of beef served with the full five daily portions of vegetables, including two types of potato. Again, Giuseppe's recommendation of a Chilean Camenere red wine tasting similar to a better-than-average merlot, was a well-considered choice. A flamb�ed banana completed our dinner and we then returned to the Morse Bar for coffee and an interesting selection of petite fours accompanied by a glass of an incredible Glenmorangie whisky. This was much less sweet than the usual Glemorangie whisky and was defined by a slight hint of orange. We later discovered that Glenmorangie makes a whole range of unusual whiskies. Contrary to popular belief, the Randolph was not named after Randolph Churchill, who had connections with the nearby Blenheim Palace. The name was actually chosen because of its close proximity to the Randolph Gallery, part of the new Ashmolean Museum which, as I have said, is just opposite the hotel.